Alexis Bronson grows cannabis clones. He is still waiting for a larger space under Oakland’s marijuana equity program. Alexis Bronson thinks the advantage Oakland’s cannabis equity program promised him is shrinking. That’s because he doesn’t yet have space to grow his clone plants. 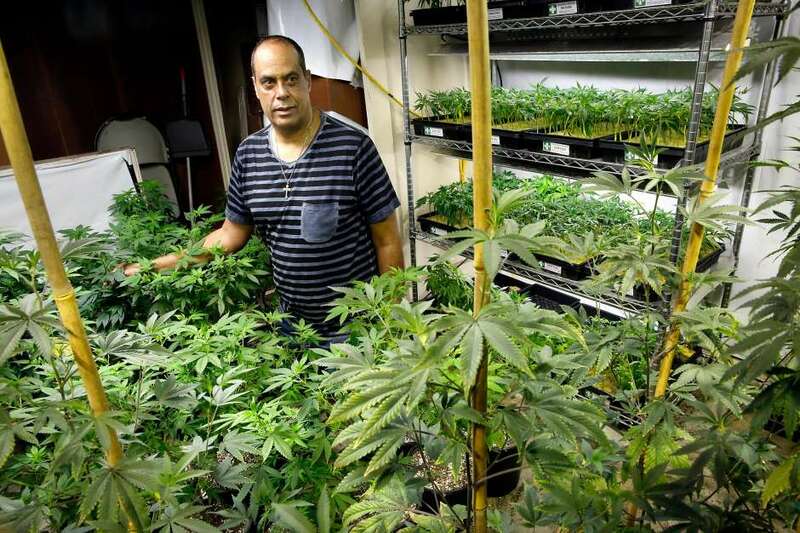 Oakland reserved half of its cannabis permits for applicants like Bronson, a black man who’s been cultivating cannabis for more than 30 years. As a teen, Bronson sold weed to his Berkeley High School classmates, but he was hoping that Oakland’s equity program would help launch a successful, sustainable business. The goal was to allow people living in parts of the city disproportionately affected by the failed war on drugs to get to the front of the pack of businesses seeking fortune in California’s cannabis gold rush. To get the equity program off the ground, the city moved what it calls general applicants to the front of the permit line if they “incubated” equity applicants by providing them with 1,000 square feet of free business space. The space must be provided for three years. Bronson signed lease agreements with two incubators — NUG and Joyous Recreation & Wellness Group. He thought he’d be cultivating clones in the spaces by February, but both companies encountered significant construction delays. According to Bronson, John Oram, CEO of Bloom Innovations, a horticulture consulting and management firm of which NUG is a subsidiary, told him his space, a greenhouse in East Oakland, would be ready in November. Bronson told me Joyous Wellness hasn’t updated its timeline for him to move into the West Oakland warehouse. Bronson got tired of waiting, so he asked the city to revoke the local authorization for the temporary state licenses of NUG and Joyous Wellness for failure to deliver the space. Without local authorization, businesses would run afoul of local and state cannabis laws. I’ve long supported the idea of Oakland’s equity program, but here is another example of how structurally flawed the implementation of the program has been. Bronson’s state licenses might expire before he gets into his spaces, and he doesn’t have the money to renew the licenses because his business isn’t generating much revenue. And Bronson has a point: Waiting a year to start operating doesn’t seem like a head start for an equity business. After attending a hearing for Joyous Wellness at City Hall on Friday, it seems that untangling disagreements between equity and general applicants could get messy. Before the mediator, Denise Eaton-May, could get comfortable in her seat, the squabbling began. Joyous Wellness didn’t realize that its letter of authorization had been revoked, and that the hearing was actually an appeal of the city’s decision and not a hearing on proposed revocation. A company representative asked for an extension, which the city granted against the wishes of Bronson’s attorney, Natalia Thurston. The hearing was rescheduled for later this month. “There’s no enforcement of these agreements,” Thurston told me. “There’s no motivation for these people to follow through — unless the city does take action” to revoke permits. A representative for Joyous Wellness declined to comment after the hearing. Greg Minor, an assistant city administrator who signed the revocation notices, also declined to comment. NUG’s hearing was also scheduled for Friday, but the company had already agreed with Bronson to postpone it to July 31. The permit process for any new industry is expected to be complicated and slow, and last month I wrote about NUG’s repeated delays with building permits and inspections. Revoking permits absolves the city from any role in the equity program’s problems. But the city shouldn’t escape without fault, because the city provided the incentive — no, the reason — for general and equity applicants to form partnerships in the first place. Selna said NUG doesn’t blame Bronson for asking the city to revoke NUG’s letter of authorization. In fact, Selna attended the Joyous Wellness hearing and spoke to Thurston, Bronson’s attorney. The two sides are working to reach a settlement before their hearing. In the meantime, Bronson has watched his nursery business wilt. He said his clone-selling season is from February to June, when he makes most of his money for the year. Bronson has been trying to subsist by growing plants in the garage of his East Oakland home. Because he has limited space, he’s only been able to produce clones for popular strains like Purple Punch. He says his connections with dispensaries have dried up. And that’s not what the equity program intended. San Francisco Chronicle columnist Otis R. Taylor Jr. appears Mondays and Thursdays.